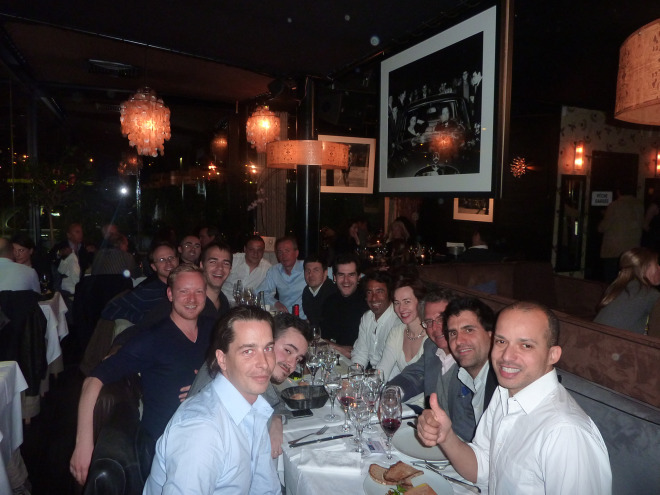 My entrepreneur dinners have become somewhat of a tradition on my visits to Paris. They allow me to reconnect with my old Internet friends from the bubble days and meet the new generation of French entrepreneurs. This time we were not well served by the logistics. While the food and setting of the restaurant La Plage on the Seine in the 15th were fantastic, it was noisy, the long rectangular table did not help conversations and the restaurant was not able to accommodate the fact that 15 people showed up while we had booked for 10. Next time, I will make sure we have a private room somewhere with a round table. I also wish to offer my sincere apologies to the entrepreneurs present for having to absent myself from the proceedings for so long for a phone call. Fortunately, the inconvenient setting and my long absence seemed to be made up for by the number of new faces who showed up making the conversation all the more interesting. In the front right of the photograph, you can see James Blouzard, who headed Lastminute.com in France and now runs Wonderbox a very successful European online gifting company focusing on life experiences with nearly $100 million in revenues! He was joined by his wife Bertile Burel who co-heads Wonderbox and cannot be given enough credit for putting up with 14 men! I have actually known James since I was around 10 years old as he also lived near Nice and shared my passion for remote controlled planes. We reconnected over a common love of Age of Empires, Internet startups, adventure travel and martial arts in 1999 and have kept in touch since. In the front left of the picture, you can recognize Aymeric Chotard who is also an Internet old timer. We met in 1999 while he ran an online barter site, Trokers.net. In 2000, I became an angel investor in his company and provided him with a business plan to launch a Half.com type site in France. I actually don’t think I helped all that much as I seem to remember he was already headed in that direction, but I like to believe I helped a little. In any case, after a long hard slog which took every bit of ingenuity and perseverance he could muster, his new site, 2xmoinscher.com, became successful and he sold it to Les 3 Suisses. He recently left Les 3 Suisses and has been taking a well deserved break between Bali and Paris while making real estate investments. To James’ left you find Gael Duval. Gael was one of the co-founders of BLL which was the online ad agency which did all the online marketing for my first Internet startup, Aucland, my southern European copy of eBay. Gael can also take credit for finding the name Aucland. Aucland was originally going to be named Alibaba, but the Chinese B2B marketplace company ended up taking the name. Aucland was then going to be called OLX, but two weeks before the launch one of our competitors named Quixel renamed themselves QXL. We felt the names were too close and that we would be accused of plagiarism so I kept that name for another day. Gael came up with the name Aucland. It was available and easy enough to spell so we ran with it. Gael sold BLL to CLM/BBDO and also introduced us to them. They ended up producing for us an amazing TV ad which won a Silver Lion at Cannes’ advertising festival. After BLL, Gael created UnSoixanteDixSept, another online ad agency and Nextedia a leading online media buying agency sold to Lagardere which proved to be an even greater success. For the past few years he has been running JeChange.fr which is the French equivalent of MoneySuperMarket. To Gael’s left, you can see my dad who has been an important advisor and thought partner during my entire life. His advice proved especially invaluable while I was running Aucland and Zingy. My dad is also an entrepreneur with expertise in a much more staid but very lucrative industry: pest control. During the past 20 years he did a rollup of pest control business in Florida, Arizona and Puerto Rico. His company, Oliver Exterminating, now dominates those markets. Luis Talavera sat to Bertile’s left. It was the first time I had met Luis, but I feel a sense of kinship as he shares my love of adventure travel which in his cases expresses itself through a love of climbing. He is currently training to climb one of the world’s highest peaks in the Himalayas. He chose not to climb Everest because 5% of the people who climbed Everest in the past 25 years died. Only 1% of those who climbed the peak he is going to attempt to climb died. Clearly a very safe choice 🙂 I still can’t believe Gladwell thinks entrepreneurs are not risk takers! Luis worked for Microsoft for 15 years, moved to Paris to enjoy its quality of life, started a new company which he sold a few years ago to EMC and has recently advising one of Bessemer’s portfolio companies. Martin Destagnol sat to Luis’ left. We had exchanged a few emails, but had never met. Martin has been getting a lot of press recently as he created Plyce, a slightly different take on the FourSquare model which was just funded by my friends Marc Simoncini and Jeremie Berrebi (and Xavier Niel though I don’t know him). Jean-Xtophe Ordonneau from Melcion sat to Martin’s left. I have met Jean-Xtophe a few times over the years and he’s always been very thoughtful. He is a strategic consultant to a number of Internet CEOs such as Fabrice Boutain, my good friend and CEO of Anxa. He also does M&A and financing advisory work. Hubert Roche, the CEO of Netfective sat to Jean-Xtophe’s left. I met Hubert briefly when I was in Paris last December for Leweb. He heard one of my radio interviews on BFM and reached out to me. Once I met him it was clear we were like minded. His company successfully provides software that automates the building of software. For all his success, he is extremely humble and gave us a good sense of perspective when he estimated that the restaurants we were dining in probably did $10 million in revenues per year and that even successful startups only really amounted to a few Paris restaurants in terms of revenues! In the far left corner you can glimpse Jean-Laurent Wotton. Jean-Laurent was one of the first programmers at Aucland and was probably my favorite programmer to work with. He had as much dedication as anyone in the company! If I needed anything done urgently, I could always go to his office and work on the product with him. He patiently indulged my desire for all the pixels to be perfectly aligned and for the product to both look and be fantastic. It has been a pleasure to see him grow professionally over the years and to broaden his horizons. He joined Google in London many years ago managing partner relations for most Google tools and APIs (Maps, etc.) and is currently completing an MBA at London Business School. I can’t wait to see what he does with his joint technical and business experience! Laurent Kretz sat to my right. After a few startup attempts, he is launching a new startup Submate to help people find things to do and people to meet near where they live and work. Pascal-Emmanuel Gobry sat to Laurent’s right. He’s an editor for Silicon Alley Insider and StartupDigest France as well as being a consultant. Franck Le Ouay sat to my left. He is one of the founders of Criteo a successful ad retargeting company which he created with Romain Niccoli and Jean-Baptiste Rudelle. While I had not met Franck until that dinner, his partner Jean-Baptiste was the founder of Kiwee, France’s largest ringtone company and one of my inspirations for Zingy showing once again how small the Internet world really is! I am only sorry that my friend Minter Dial who is part of my extended family had to leave as the table was overflowing with people. Minter’s dad was the ex-husband of my aunt. Minter has always been one of my favorite people. He’s extremely smart and sporty. He always proved a worthy adversary in tennis and padel. He worked for Loreal for many years, in recent years trying to bring them to the Web. More recently he has become a successful and much thought after consultant to CEOs with his company TheMyndSet and a thoughtful blogger. Between the old timers and the new faces, it was quite clear that the French Internet community is thriving. I am looking forward to the next dinner!